Make your office space shine with the stunning Cherry Creek collection. 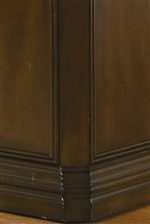 These elegant pieces of furniture are made of a beautiful combination of hardwood solids and warm Cherry veneers. 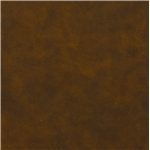 The medium brown finish is characterized by very light distressing for a semi-rustic classic look. Functionality is a key aspect of this collection. The wall systems include many shelves and doors for easy storage and display of books and other decorative items. 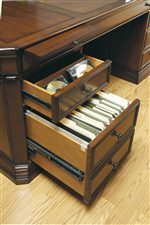 The executive desk and the credenza in this collection both offer ample storage space in the form of divider drawers and file drawers. 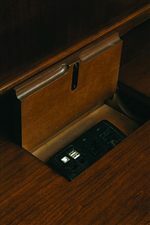 They also include useful pullout writing surfaces and keyboard drawers. Refresh your office decor with the glamorous Cherry Creek collection. Browse other items in the Cherry Creek collection from Stuckey Furniture in the Mt. Pleasant and Stuckey, South Carolina area.